A friend of mine and recently returned from Nuremberg. All my loved ones know that the best thing to bring me back from anywhere, I literally mean anywhere, is food. 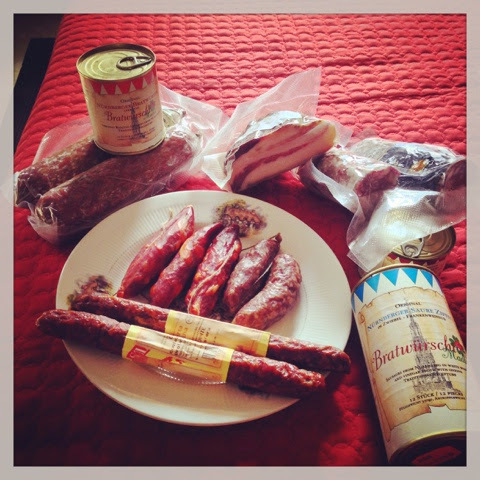 This time I was endowed with a bag full of wonderful German meats! Now that is my kind of sausage party! I love pasta, I need it every few days. Most of those times I make it - either from scratch or from a packet. As I was greedily trying, slice after slice, of every type of sausage that sat before me, I thought how wonderful would this spicy sausage be with some tomato sauce and gnocchi! I did make my own gnocchi but you can buy it. I have seen some at Modern Bazaar . Diva too has a deli - perhaps if you let them know in advance they can sell you some - as they do sell other fresh raw pastas. Either way I will provide a recipe below at the end. The title of this post says "Recipes for People who Cook" because the recipes I usually share are my creations and I don't measure anything. But I have tried to quantify it as best as I could. It is a simple enough recipe that most home cooks should be able to use their discretion to reduce or increase things. I also have a few cans of Italian tomatoes handy. In this recipe I used a can of cherry tomatoes. I you prefer to make your own don't use the regular desi tomatoes. Try and find a redder sweeter variety. Foodhall has some. Take 5-6 Ripe Medium Sized Tomatoes. Preheat oven. Cautiously sprinkle with salt and olive oil. Now this part is important. Do not put in an oversized baking pan. Try and find a cosy fit, because the more gaps the more of your juices will burn and dry up. We want to keep all of it. If you don't have a small enough oven pan - use several layers of foil. Roast in oven till they are completely cooked and ready to burst. Then proceed to burst them - joyful! Use a masher or fork. Do not blend - a few chunks here and there are desirable. 1 Packet Cooked Gnocchi - You need 2 big pots - One with water and ice - half way. The other on the stove with just water - Boil water. Add a bit of salt to the boiling water. Throw in gnocchi. As the gnocchi rises to the surface you can use a strainer and remove. Immediately add the cooked gnocchi to the other pot with ice/water. Keep for only as long as they need to cool down - a few seconds. Strain through a colander and set aside. 1 Can Cherry Tomatoes - About an 800 gram tin . If you wish to use fresh tomatoes - follow instructions above. Red Jalapeño Chillies - 5-6 Sliced . Taste them - usually they are extremely mild in which case combine with 2-3 Bird's Eye Chillies sliced. I remove most of the seeds from these as they are quite hot. Brussel Sprouts - 1 Packet. Separate petals/leaves as much as possible. Garlic - 7-8 Cloves. Finely diced . I love garlic and I use a lot. Sweet Basil - 15-20 washed leaves. Grow your own herbs. It will allow you to understand varieties of the same herb and their uses better. Using a sweet Italian basil for this is important rather than any other basil variety. Fry green bits of spring onions. Strain and set aside. Reduce oil by half - set extra aside. Add garlic and whites of spring onions. You want to cook and soften both but do not allow them to crisp or turn golden. Add white wine. Simmer and allow it to reduce to about half or a more than half. Add your canned or roasted tomatoes now. If using canned cherry tomatoes - mash up a few but keep the other half intact. Mix in your gnocchi. Switch off heat. Toss in the lightly crisped brussel sprouts and fried green onion green bits. Take out in to serving dish. Lightly drizzle the extra virgin olive oil you kept aside from frying the brussel sprouts. Serve with some grated parmesan on the side. Now I end up making my own gnocchi because it is usually too last minute to order and buy some - my cravings kick in without any warning - and they must be appeased then and there. No I am not pregnant. God save me from my cravings when that day arrives. I have made it a couple of times now that I don't follow a recipe. 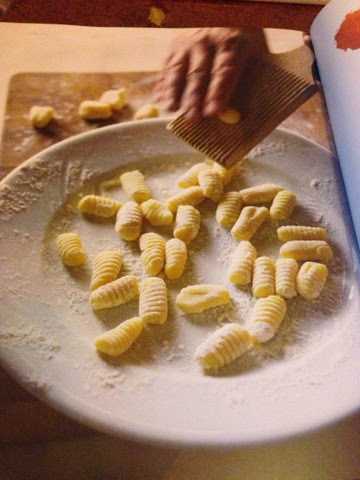 But I am sharing one from my pasta bible, "The Art of Pasta" by Lucio Galletto & David Dale, to make things easier for you all. 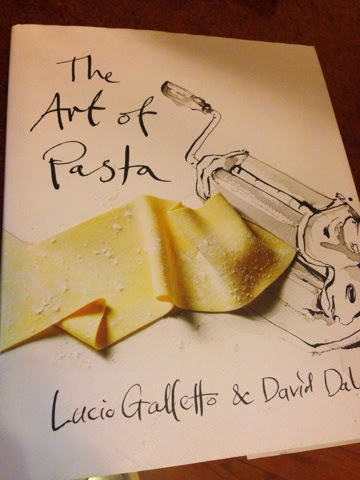 It's a great book for any pasta lovers out there to get their hands on. 1 Kg Potatoes - This is the MOST important thing - the type of potatoes. They need to be floury potatoes, NOT new or waxy potatoes that are wetter. This is important because the drier the potato the less flour you will need to add enabling them to be at their lightest best. 1 Egg - Organic eggs are best - Remember the fewer the ingredients in a dish the better the quality should be. I liked to very lightly beat my egg before using. Peel the potatoes. Now you don't want to mash them. Instead either pass them through a potato ricer or grate them through the finest side. This will allow your gnocchi to be lighter. Once potatoes are completely cooled. Add you egg and mix ever so lightly. Add 200 grams of flour first. Only add more flour if it feels too wet. 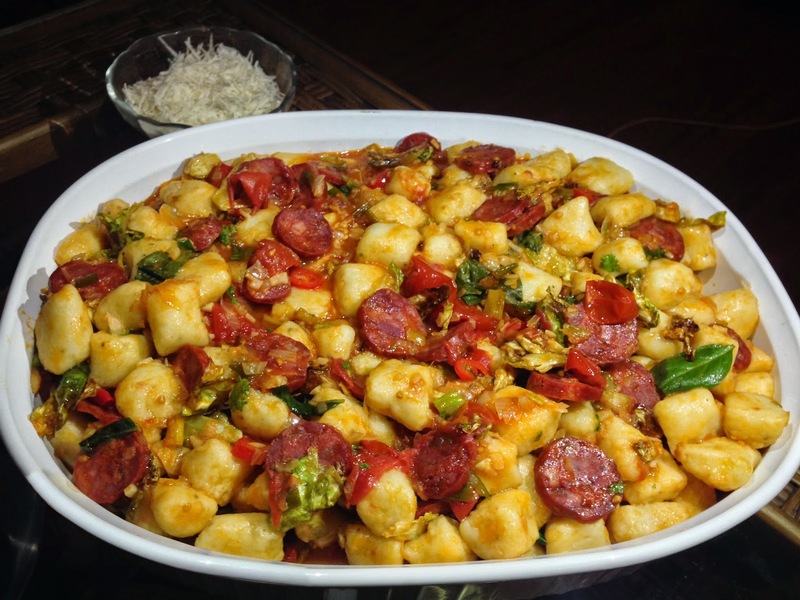 At the same time you don't want it to be too dry, with too much flour as it will make your gnocchi heavy. Mix quickly to form dough. Remember you do not want to work your dough as such - just enough to mix evenly - as it will make your gnocchi rubbery and tough. Now to a clean surface, sprinkle lightly with flour. Divide your dough in to 6. Roll each bit in to long snake like tendrils - about the thickness of a fat finger (see image below for size). Of course you can make them fatter, shorter, longer, that is up to your preference. They will bloat a tiny bit after you cook them too. Now in a pot big enough, boil water with salt and carefully dunk in. Boil in batches if your pot is not big enough but don't over crowd. As soon as the gnocchi rises to the surface it is ready to be strained out. You can either put directly in to your sauce or cool in an ice bath, drain and keep aside (which is what I suggest). Now use as much based on the quantity of the sauce above. I would gauge according to how wet or dry you like your pasta serving.